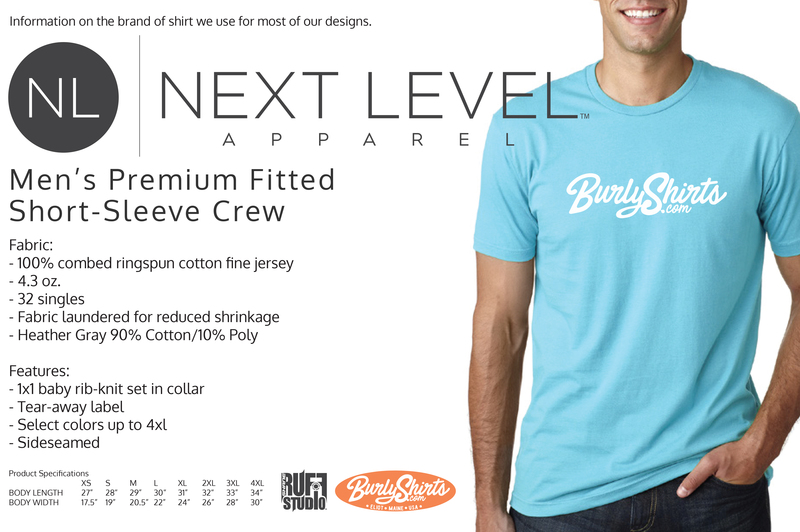 We mainly use Next Level Apparel for our shirts but occasionally we do use other brands & try to make that clear in each product profile. Below is additional information on some of the other brands we use. We will accept all returns for any reason if you are not satisfied with your purchase within 30 days of receipt of your order. You must return your purchase with its original packing invoice and clearly state the reason for your return. It must be UNWASHED and still tagged. You will be credited your original purchase cost less shipping. You can also use the "Return Merchandise Authorization" option through your profile with recent orders. If you want to exchange a product purchased for a different size, please ship the order back to RUFF STUDIO and we will exchange the size and ship your order back to you. If you want to exchange a product purchased for a different design, please ship the order back to us and we will exchange your order for the new product and either charge or credit your credit card the difference. Sale Items and Discontinued Designs are not available for Exchange or Return and all sales are final on those items. Other items may not be eligible for returns or exchanges - please contact us prior to requesting a return if you have any questions. We use the USPS (Post Office) for shipping our products to you. Once you order a product from us and are prompted to enter in your shipping information your actual shipping cost will automatically be calculated based on the ship to address. Given we mainly "Print on Demand" as orders come in - we offer Priority Mail, First Class & Parcal Post for shipping & some orders can take 7 to 10 business days to fill. If your order is urgent - please email info@ruffstudio.com for expedited shipping options & if they are available. We ONLY ship via USPS First Class for all international orders - and our shipping calculator will give you an accurate cost based on weight and destination (please note there is a 4 pound limit on all international orders for First Class shipping). Expedited shipping is not available on international orders. (Tracking numbers are NOT available since other countries are not conencted to the USPS Postal System) International items may be subject to customs processing & import fees and additional charges & can take up to 6 weeks for delivery to some destinations. The postage cost does not cover these taxes or additional fees. There is also a 4 pound limit on First Class International Mail.